sliderider wrote: Is there a difference between a 6x86MX PR300 and an MII PR300? I don't know for sure, but afaik the MII was just a renamed 6x86MX to make it sound more like it was in the same tier as Pentium 2. The PR system remained the same I believe. No, and I'm not about to. If there isn't a chart somewhere comparing the two chips side by side, I'm not going through all that literature trying to find any differences. Heh, I'm also joining the club. 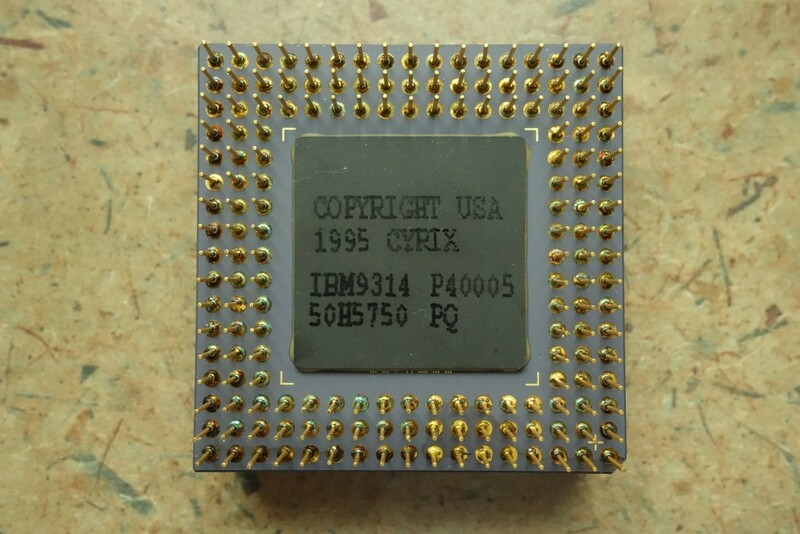 I don't have any noticeable Cyrix chips on hand at the moment (apart from an IBM 486 and a Cyrix 387 FPU) but I had them in the past. My first 486 was a Cyrix DX33 and the last one was a 5x86 100 (overclocked to 120 by mistake, for all its life). This one was a very handsome chip with its green heat sink (and no fan), and easily outperforming then common Intel/AMD DX4-100s. Only Cyrix-based anything that I've got on hand is my MediaGX-based Compaq Presario 2200. I'd love to get a hold of a 6x86 or something among those lines one day. Artex, could you also show an image of the bottom of that CPU? feipoa wrote: Artex, could you also show an image of the bottom of that CPU? I originally posted here, since I'm unsure of the date of manufacture. How did you derive that? Past internet research now embedded into my brain. 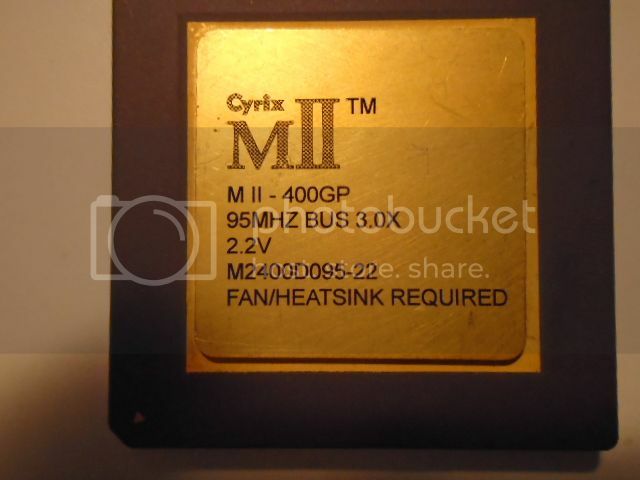 CPUshack's website has some disection information of Cyrix CPU markings. feipoa wrote: Past internet research now embedded into my brain. Perfect! Thanks! Just out of curiosity, why did you wanna see the bottom? Were you hoping for a later-dated chip that could possibly do 133Mhz? I was only wanting to determine how deep into 1995 your -100HB CPU went. The heatsinks with -100HF are the newer ones. 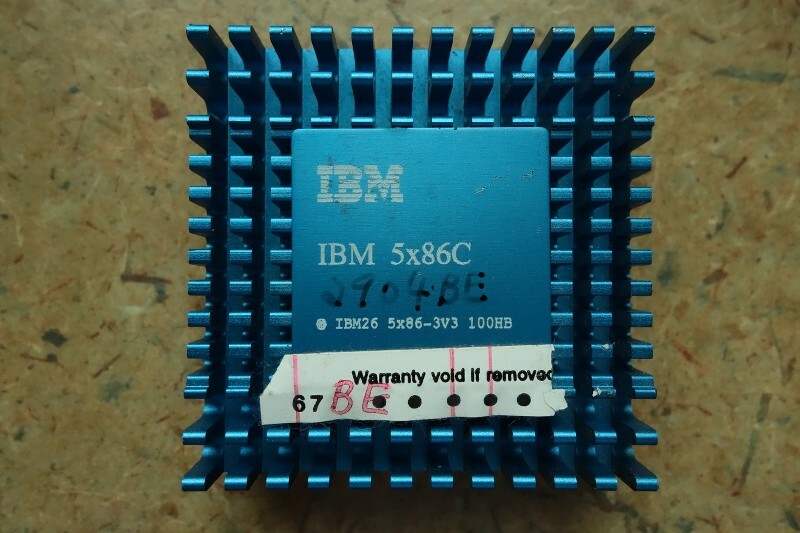 Since you inquired about 133 MHz operation, I now have 4 IBM 5x86c chips which run stable at 133 MHz, but they all are from week 50, 1995 or newer. I tested about a half-dozen chips from before this datecode and they all failed. 3.75 V seems to be the sweet spot, however I have an unconfirmed hypothesis that this voltage requirement may be related to some kind of chipset-CPU current relationship. It seems too coincidental that all 4 chips wanted exactly 3.750 V to pass all my grueling stability tests. Note for those reading this: just because your IBM 5x86c has a datecode newer than or equal to Week 50, 1995 does not guarantee it will operate well at 133 MHz. I have run into chips from weeks 12-38 of 1996 which failed at 133 MHz. feipoa wrote: I was only wanting to determine how deep into 1995 your -100HB CPU went. The heatsinks with -100HF are the newer ones. Gotcha. Interesting findings as well with that voltage requirement @ 133Mhz. My last Cyrix find was two of these, and no they weren't the two that were in that scrap gold lot recently. I bought my two from two different sellers about 2 months before that scrap lot came up for sale. I wouldn't have posted it here if I didn't already have two of those 2.2v 400GP's. My last Cyrix find was my second Cyrix 5x86-133/4x. The only other Cyrix desire I now have is a working Joshua unit. EDIT: Actually, a GXM-300 MHz is also desired. By the way have Cyrix released an 90 MHz CPU? IIRC there was an engineering sample with 90x3 speed. Well, they have exclusive CPUs for 40 and 55 MHz FSBs (6x86-P90+ and P133+), they invented 75 and 83.3 MHz. Why not add another exclusive CPU?